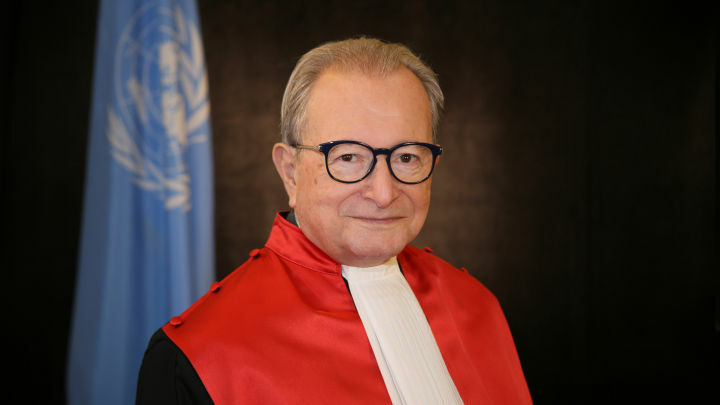 On 8 April 2019, the President of the International Residual Mechanism for Criminal Tribunals (Mechanism), Judge Carmel Agius, concluded his first official visit to the Republic of Rwanda (Rwanda). The visit took place on the occasion of the 25th commemoration of the Genocide against the Tutsi in Rwanda. Over the course of a week, President Agius met with a number of high-level Rwandan government officials, including Dr. Richard Sezibera, the Honourable Minister of Foreign Affairs and International Cooperation; Mr. Busingye Johnston, the Honourable Minister of Justice and Attorney General; Mr. Jean Bosco Mutangana, the Prosecutor General; and Professor Sam Rugege, Chief Justice. In all of these meetings, President Agius provided an overview of the Mechanism’s work and discussed the importance of enhancing the existing relationship between the Mechanism and the Government and people of Rwanda. In honour of the victims of the Genocide, President Agius visited the Gisozi Genocide Memorial Centre in Kigali and the Murambi Genocide Memorial, describing the latter as a “very emotional, incomparable” experience. He also met with representatives from the Commission for the Fight against Genocide (CNLG) as well as IBUKA, the umbrella association for Genocide survivor organisations in Rwanda, where he engaged directly with victims regarding the work of the Mechanism. The President further met with staff from the Mechanism’s field Office in Kigali, where he reaffirmed the three main priorities of his Presidency and the importance he attaches to a positive work environment, as well as strong staff morale and performance. In addition, President Agius attended the two-day “Kwibuka 25 Kigali International Conference: Preserving Memory, Championing Humanity”, which included prominent keynote speakers such as Mr. Adama Dieng, the United Nations Special Adviser on the Prevention of Genocide and former Registrar of the International Criminal Tribunal for Rwanda. President Agius concluded his visit by attending, together with Registrar Olufemi Elias, the official ceremony marking the 25th Commemoration of the 1994 Genocide against the Tutsi on Sunday, 7 April 2019. Later that day they joined the night vigil in honour of victims and survivors at the Amahora National Stadium in Kigali. Mechanism Prosecutor Serge Brammertz attended and participated in the commemoration event held in The Hague, while the Mechanism was also represented at commemoration events in Arusha and Dar es Salaam.